Experience Sydney from inside a chauffeured Limousine. Travelling by yourself, with a partner or large group? Contact our friendly team to create a tour of Sydney like no other. Professional chauffeurs will transport you in style and comfort while you sightsee sensational Sydney. Sydney is Australia’s largest city. It is also one of the most famous cities in the world. It’s beautiful landscape, iconic landmarks and fantastic reputation has even resulted in many people confusing Sydney as Australia’s capital. However Australia’s Capital is in fact Canberra. There is no better way to experience Sydney other than a city tour. However if you find crowded tour group buses unappealing why not do it in complete comfort and luxury? Our chauffeured Sydney limousines are the ultimate way to get around Sydney for a city tour. Take control of where you want to go and how long to spend in each location. Avoid the crowds and experience Sydney in a more intimate state. As you travel between venues on your Sydney City Limo Tour you can experience the finer luxuries of our vehicles. Leather seats, tinted windows and pleasant climate control are all standard. Also in our stretch limos and stretch Hummers you can enjoy a bubbly champagne from the bar and be entertained by the state of the art Audio Visual systems. 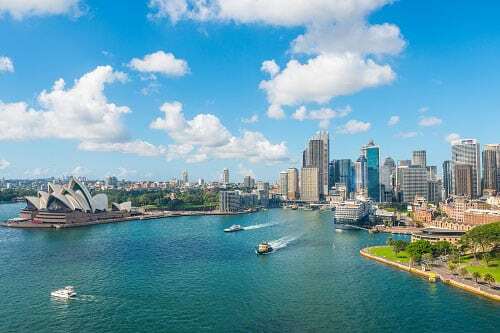 Most of Sydney’s visitors are familiar with the iconic landmarks of the Sydney Harbour Bridge and Sydney Opera House, but Sydney has so much more to offer. No matter if you are a first time visitor or have lived here your whole life there is always something new to see and experience. Sydney is home to many world famous landmarks that appear in photos circulating all around the world. They have definitely helped put Sydney on the international map. Allow us to chauffeur you to these locations so you can get out, walk around and really experience them. Australia is known for its unique wildlife such as the iconic Kangaroo and Koala. However our beautiful country also has countless other fascinating flora and fauna. On your Sydney city tour check out the various Zoos and wildlife parks to see Australia’s wildlife up close. Our city beaches our world famous with the most well-known being Bondi Beach. Here you will often find celebrities walking down the street or sun baking on the sand. Another very famous beach is Palm Beach on the North Shore. Palm Beach has been made famous by the popular TV series Home and Away which is broadcast in many different countries. On the TV show this beach is known as Summer Bay. Other famous beaches include Manly Beach and Coogee Beach which also attract many overseas guests. Sydney is home to many of Australia’s Museums which showcase our history, culture and art. Various exciting exhibitions throughout the year result in a new experience each time you visit these amazing venues. While the above lists contain many famous attractions for you to incorporate into a city tour there are countless more tourist attractions around Sydney. We could go on and on about the seasonal events, concerts and parades that occur every year, however the end result will always be the same. And that is – there is heaps to see and do in the gorgeous city of Sydney. When you book a Sydney city limo tour with us you will enjoy unmatched comfort and luxury treatment. You can choose to visit the exact sights that you are interested in. Also you may choose to stay at some locations longer or shorter depending on how you feel on the day. All the while you will be enjoying the superior services of our professional chauffeurs and luxury vehicles. Be in charge of your sightseeing experience for your Sydney city limo tour. Give us a call and we can tailor a travel package depending on your time, budget and group size to give you an unforgettable experience in Sydney. The perfect solution for entertaining clients or just to experience Sydney like no other means.